Called La Stanza dello Scirocco, the collection of table centrepieces is made of steel in black or white. In this podcast, recorded at the Design Museum in London during the launch of the collection, Trimarchi talks about working with Alessi, the inspiration behind this project and his obsession with shadows. "La stanza dello scirocco” is a range of items born out of the abstract and motionless atmosphere of a magic place: the room in large Sicilian country homes where one is forced to seek shelter from the sultriness while waiting for the sirocco wind to die down. It is a room without windows in which you can do nothing but ponder the wind that is undoing all sublunary things outside. The upshot is a collection of geometrically irregular items made up of small splinters of various sizes, interlaced in an unstable balance. Their peculiarity lies in the fact that they have been designed with their shadows as starting points by halting unforeseen moments of fragments agitated by the wind, shadows that multiply and are as restless as unfocused photographs, that are determined to reach the edges of the table and, in disproportionate sizes, to go beyond to the walls and to the ceiling. For me, the magic lies in the fact that the project was hatched from things that come to pass outside the object itself, as if each basket and fruit dish were defined for the most part by that which it generates, i.e. its shadows, rather than by its function. 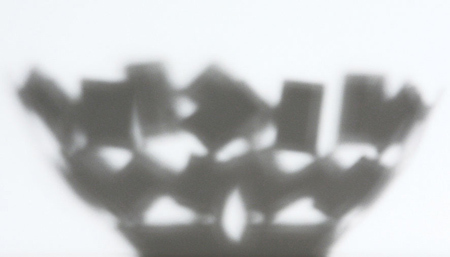 At the outset, I designed a great deal for the sirocco room, endeavouring to stop paper photograms in flight and shadows in light movement. And so I came up with the idea that “La stanza dello scirocco” could be recounted through the story of drawings done by hand and through images of shadows, and that we could then ask everyone to exert themselves ever so slightly and make a small input with their own imaginations.